Nedra Weinreich who has a great blog on social marketing also does training seminars. Most of the focus is on applying social media techniques to social marketing programs. Our team does a lot of social marketing - behavior change - mostly in the public health and driving spaces. So, I have a deep appreciation for what Nedra is doing to introduce a community driven by science most of the time to try and apply the techniques that truly amplify word of mouth. Four things came together in healthcare and social media towards the end of 2006. Together, the impression is clear. 2007 will be a big year for consumers creating useful content to further their healthcare needs. Monique Levy, a researcher at JupiterKagan will be releasing some interesting research this January. She gave me a little preview and we discussed what some of the opportunities are for healthcare professionals to engage in a universe where peers are talking about issues, doctor and hsopital recommendations and treatments. Of the people looking for health information online (65%), 41% are creating content; 69% are consuming and 32% are doing both. (look for her research soon and that will confirm the context I am remembering for these numbers). "- As many as 34 percent of online users said they connected to others or the content they created online about health and wellness issues using various types of peer-to-peer and social media in the last year. Of these health connectors 69 percent are consuming content, 41 percent creating and 32 percent doing both." The short story is that a ton of folks are creating content: either blogging or message-boarding about issues, treatments, hospitals & doctors. The Healthcare Blogging Summit was the first in a series from Dmitriy Kruglyak. It felt like the healthcare bloggers were connecting offline for the first time. All povs were lumped together in one room (literally) - policy folks, marketing and business consultants, hospital CEOs, blogging doctors, and patient advocacy groups. Dmitri is rolling out more of these in 2007 (next one in Vegas) and the program will likely focus and get more sophisticated. Revolution is in beta. They were nice enough to give me an account and I will be reviewing it this week. Fard has already provided a pretty good review. Like some of my peers, my parents are struggling with new health issues. My dad (80) is undergoing radiation treatment for prostate cancer. Both the disease and the treatments have become common place. He will be getting a computer for the first time in his life in a few weeks ostensibly to share email with family members. But I am square in the bullseye of the generation using the Web to understand what choices he has (and what mine will be when my time comes). What else will happen this year to advance social media in healthcare? Monday in DC was the first Healthcare Blogging Summit nestled into the much larger Consumer Health World event. This is Dmitriy Krugliyak's baby. He runs the Medical Blog Network which is both an aggregation of health-related bloggers and an attempt to bond them around common concerns related to the heavily regulated and sensitive world of healthcare. He told me that they will hold 3 more of these next year bundled into larger events like this one. that's actually a great model and may do more for spreading the word than holding a little specialty event on blogging. I spoke on a panel that featured public health professionals, a CEO of a hospital system (who was very on-message about his "brand" - nice work), a communicator from March of Dimes who like me was a pre-bubble Internet professional. He also shared about an initiative to reach out to mombloggers regarding flu communications and actually allowing them to communicate directly with scientists. We do a lot of work with moms and mombloggers and this is a great idea. There is no reason the CDC couldn't form a group of moms online to help guide them on health communications that impact the family and then actually become ambassadors of that message. The question is will they ask them for that level of involvement or only look at them as messengers. Patricia Goldman from MOD shared about shareyourstory.org where they connect NICU (preemies) families into an active community. If you dive inside to the Parent to Parent boards there is a lot of posting activity. This is a great example of hosting a dialogue that really helps people (and was probably happening in some other, less powerful way). We often wrestle with just how to apply some of the new, new media "best practices" we employ on behalf of our commercial clients for our government clients. Blogs and other formats that invite people into a conversation mean letting go of some control. Generally, that "letting go" is a good thing - a demonstration of willingness on the part of an organization to really engage in a conversation and not rely on throwing messages over the transom to communicate. In many cases, government teams within agencies struggle with layers of communication requirements: scientific fidelity, risk-aversion and sometimes the burden of a large bureaucracy. "The mission of the National Center of Health Marketing is to protect and promote health and advance CDC’s goals through innovative health marketing programs, products, and services that are customer-centered, high-impact, and science-based. NCHM helps define the future of health marketing within CDC, the federal sector and beyond." Their definition for "health marketing" sounds very close to "social marketing" perhaps without the leading "behavior change" implicit in the latter. Still, I think we are talking about the same thing. I suspect that the Center is trying to aggregate best practices from within the Centers and NIH (they feature the NCI "Pink Book" in their Resource area). It's great that they are putting a face on this initiative (see Dr. Jay's video). As for the blog, there is a single entry from July 15 so far. And a handful of comments from academic peers. The "comments" are actually a "mail-to" feature which is probably smart at the end of the day. Still, I am not sure wrapping this Web page in some of the trappings of a blog without the functions and openness is all that great. We will see how the blog unfolds overtime. And it is a start. We are deeply respectful of the power of moms in the new personal media space. We have been paying a lot of attention to how moms are using blogs and other personal media. "Are you sick and tired of making your kids a brown bag lunch everyday because lunch at their school is unfit for human consumption? Do you feel guilty when your children “buy” instead of “bring”? Are you annoyed that the healthy school lunch you pack your kid is undermined by a barrage of birthday cupcakes, candy rewards, holiday treats and vending machine cuisine?" The two women behind this are seasoned pros. Amy Kalafa is a TV poducer. Dr. Susan Rubin is, well, a doctor who has wrestled with food and nutrition issues in schools for years. While they must struggle with causing change from within the local school board/government system, they will develop a large grassroots following on the Web that will add power to their effort. The unfolding of the documentary in segments, as it is produced is a great way to keep people connected to the issue. How do you innovate on the tried and true races and "walk-a-thons" used by many non-profits yo raise money and awareness? It remains a solid and mature tactic used by many organizations around issues from breast cancer to MS.
"The main difference is location. 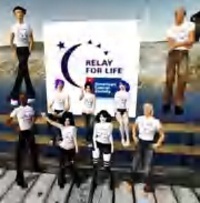 SL residents set up and decorate campsites, and sell small items to help raise Relay money just like at your local relay. However, since this is a virtual environment you may see some teams offering blimp rides, or holding sailboat races inside the park." And before you dismiss this tactic and the MMORPG community at large as some fringe activity, realize that Seond Life "members" are somewhere around 313,000. And when you qualify that "audience" as lean-forward, world-builders, their value goes through the roof. This is such a great move. Next for ACS is a contest within Second Life for the rights to design/construct their office within Second Life. These folks will get some major credit from the SLers for taking their Youniverse seriously. You can get some of the numbers on user-base for other role-playing universes here. Our agency has been fighting HIV/AIDS for as long as we have been around. We have our own personal stories (everyone does, unfortunately) and we have stories of working on campaigns for the CDC and many other organizations. Like it or not, HIV/AIDS has informed our group culture. Now that the world is marking 25 years of the disease, we wanted to give our people a forum to share their stories. And we also wanted to sound a rallying cry about the power of communications and the need to stay committed now more than ever. Is this effective social marketing? When I saw this site, I thought, "Refreshingly straightforward. Boldly risky. I'm just here because I am in the business..."
Then I asked my wife. She felt differently. She felt the url was made for men and the cleverness of the double-entendre was reaching for the wrong audience. Had it been named "Check out your breasts" and had the model been a bit more on the Dove campaign-side of reality, it would have been okay, good even. They also have an interesting pair of slides that compare Indutrial Age medicine and Information Age medicine. The rest is really Blogs 101 showing examples of health-related blogs. World AIDS Day 2005, the "official" site from the National AIDS Trust in London - They are pushing the red ribbon ina "Wise Up and Wear It" campaign push. They offer a "virtual" red ribbon - a button you can place on your Web site or email signature to demonstrate your support - again, no ticker. There is an interesting competition within the site driving users to create a unique image of the red ribbon being worn. This gets more people engaged in creating media and more invested in the cause. People can also share their "stories." These are fairly frail little sound bites but the pictures of real people helps. We All Have AIDS site/shirt - from the KnowAIDS (Viacom & Kaiser FF) folks is a bold t-shirt- based campaign. Celebrity-driven, the microsite drives us to get the shirt and click through to a dozen or so sites which would each have some call-to-action. The celebs also "left their mark" in cement in Bryant Park, NYC - something that will go "on tour". I love display of solidarity and the invitation to link arms with celebs but the overall call-to-action is a bit hard to decipher. Light to Unite from BMS - the pharma site invites users to post their stories (or light a candle which I don't quite get). Yet there is a pretty scary waiver that posters must click through to do so ("all rights to BMS....") I have nothing against pharma companies hosting advocacy alongside drug promotion which is what this site is doing. If Reyataz was one of the drugs keeping me alive, I would feel pretty good about it. Problem is the interface doesn't do anything. I can post a story but I cannot read any stories. Anywhere I click on the map interface doesn't do anything.